The second annual OMG Social Media conference slated for November 20, 2014 is looking for passionate speakers to help empower small businesses by simplifying social media for them. Speakers will be given the opportunity to use their expertise to give back to the community and join in on a collective goal to provide support to over 200 startups, small businesses and local entrepreneurs in Vancouver. 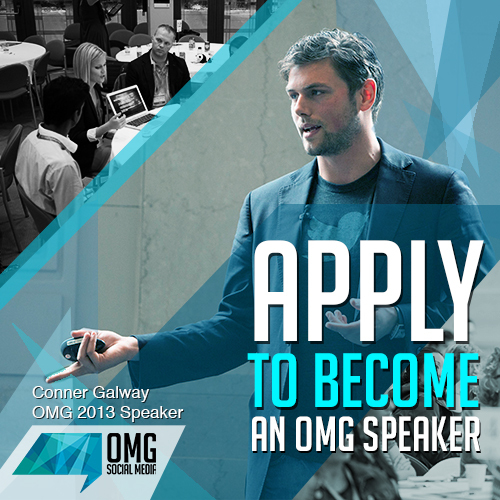 In order to achieve this mandate, OMG is looking for speakers who are social media savvy, inspired by spreading knowledge, and passionate about helping the community find success. Pamela Engel, reporter, said in Business Insider published on June 5, 2013, that “generally 50 to 70 percent [of small businesses] fail within the first 18 months.” Small businesses could use as much support from their communities as possible – particularly now, in the digital age. It is no surprise that with rapid changes in technology that continuously alter the playing field for marketing communications between businesses and consumers, start ups that lack the resources large corporations have, struggle to stay competitive against them. By providing valuable innovative social media insight, ten selected speakers will provide practical skills and insight that business owners can take away in the form of a workbook and implement right away. Last year, the conference had huge demand and helped more startups and entrepreneurs than projected and was supported by companies such as Telus and Hootsuite. Attendees also benefited from session topics such as “Setting Goals and Interpreting Analytics” and “Developing an Effective Content Strategy.” Delegates from 2013 range from a variety of businesses: from mom and pop shops, to non-profits, big tech conglomerates, start-up businesses and more. Here is an opportunity to make change in the Vancouver community. Apply now to become a speaker. Deadline for applications is on May 12, 2014.